Abstract: This work presents a method for multi-robot trajectory planning and coordination based on nonlinear model predictive control (NMPC). In contrast to centralized approaches, we consider the distributed case where each robot has an on-board computation unit to solve a local NMPC problem and can communicate with other robots in its neighborhood. 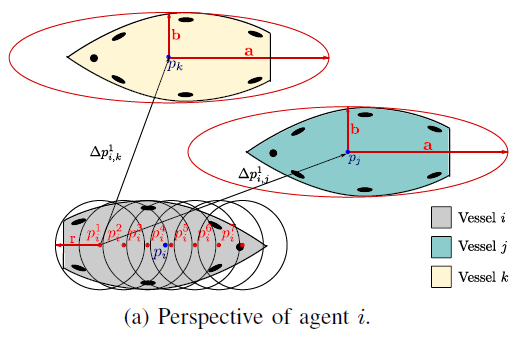 We show that, thanks to tailored interactions (i.e., interactions designed according to a nonconvex alternating direction method of multipliers, or ADMM, scheme), the proposed solution is equivalent to solving the centralized control problem. With some communication exchange, required by the ADMM scheme at given synchronization steps, the safety of the robots is preserved, that is, collisions with neighboring robots are avoided and the robots stay within the bounds of the environment. In this work, we tested the proposed method to coordinate three autonomous vessels at a canal intersection. Nevertheless, the proposed approach is general and can be applied to different applications and robot models. Reference: L. Ferranti, R.R. Negenborn, T. Keviczky, J. Alonso-Mora. Coordination of multiple vessels via distributed nonlinear model predictive control. In Proceedings of the 17th European Control Conference (ECC 2018), Limassol, Cyprus, pp. 2523-2528, June 2018.